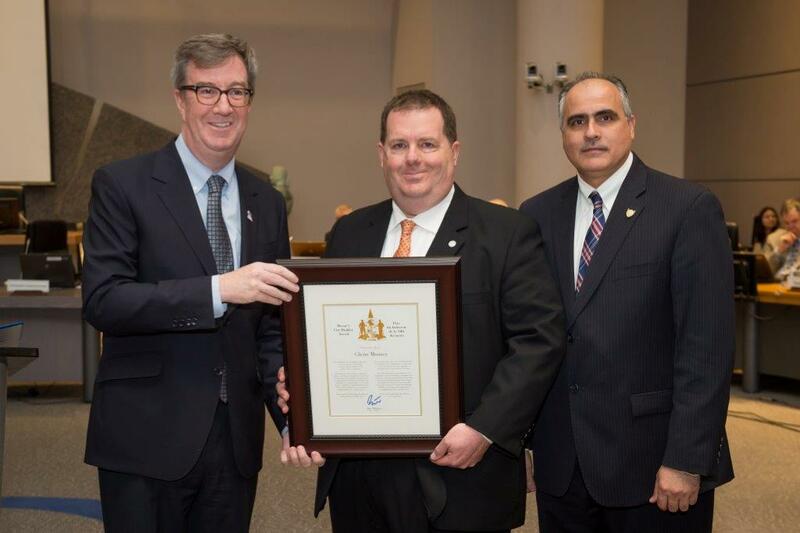 Ottawa – Mayor Jim Watson and Osgoode Ward Councillor George Darouze presented the Mayor’s City Builder Award at City Council today to Glenn Mooney for his many years of service with Camp Quality, a national charitable organization devoted to providing free camp experiences and year-round programming for children with cancer. Glenn Mooney is Director of Camp Quality of Eastern Ontario and he and his wife Pam have been involved with the organization for over 18 years. Camp Quality Canada is part of an international family of organizations originally founded in Australia in 1983 and brought to Canada in 1988. Its mission is to provide programs to support children with cancer and their families, an area not being addressed by any other organization. The aim of Camp Quality is to provide uplifting experiences for kids with cancer, and the primary focus is the incredible opportunity to create a program of empowerment, encouragement and, most importantly, fun for these amazing children. Glenn projects a warm, cheerful attitude to campers, parents, volunteers, and everyone he interacts with. He resolves conflicts and handles other difficult situations with remarkable patience and admirable tact. He loves people, works hard, and always tries to lift the spirits of those around him. His willingness to take on difficult projects, such as raising the tens of thousands of dollars required to run the camps, and coordinating with teams of volunteers to see them to succeed, is impressive.